The planet won’t stop shaking the Caribbean. This time the island of Puerto Rico has been the recipient of the force of Hurricane Maria, a powerful tropical storm that has evolved into a category 4 typhoon, and landed in the early hours of Wednesday morning on the southeast coast of the island. According to the National Hurricane Center (NHC), the eye of the hurricane has moved northward toward the center of the island and is expected to pass through the northeast coast of the Dominican Republic at the end of the day or at the latest, on Thursday morning. 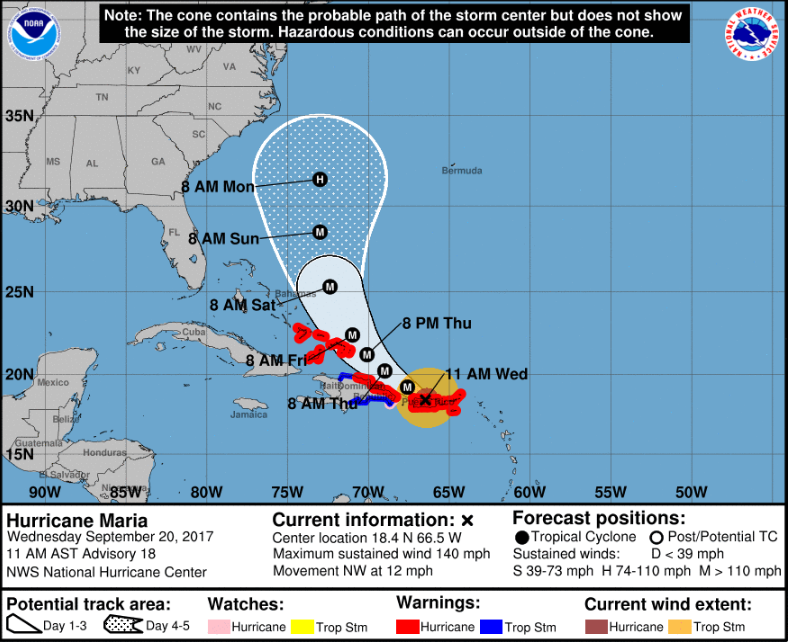 Following the same trajectory, it will arrive on Friday to the Turks and Caicos islands and Saturday to the south of the Bahamas, from where it will gradually lose its strength, according to the newspaper El País. Local media reported at 6:15 am the arrival of the eye of the hurricane to the municipality of Yabucoa, and began to advance on land at a speed of 16 kilometers per hour in a northwest direction. According to the NHC, the winds would have reached up to 185 kilometers per hour, bringing with it heavy flooding from the rise of the rivers, which has complicated the observation and monitoring of ground phenomenon due to the loss of visibility of the National Weather Service of the island. Similarly, the Municipal Office of Emergency Management (OMME) in the municipality of Aguadilla was disconnected by a failure of the electric power system and telephone communication, in the early hours of the morning according to local media reports. Between the flooding of the rivers and the entry of the sea, the State Agency for the Management of Emergencies and Disasters has resorted to the opening of five gates of the La Plata reservoir, in Toa Alta, to reduce the levels of water product of the great accumulation by the rains of the hurricane. At 9:10 a.m., local media reported the rise of the La Plata, Loíza and Puerto Nuevo rivers when the cyclone was 15 miles southwest of San Juan and 30 miles east of Arecibo. According to Gov. Ricardo Rossello, "between 80 and 90% of the subscribers of the Electric Power Authority" are without electricity service on the island, and warned, "that figure may increase, to the point that 100% of residents may not have electricity service." At 10:25 am, the municipal employees of the community of Juana Matos reported through social media that 80% of the community would have lost their homes, when contemplating what the hurricane left behind the result of its strong winds. By 11 am the hurricane had slowed its winds to 140 miles per hour, according to the National Hurricane Center, but noted that its category remained at 4. "At this time, the center of the hurricane is at latitude 18.4 degrees north and longitude 66.5 degrees west, 25 miles west of San Juan and 15 miles east southeast of Arecibo. Maria moves at 12 miles per hour to the northwest of the island, "local daily El Nuevo Día reported.